This morning the Senate Finance Committee approved the nomination for treasury secretary of Timothy F. Geithner, head of the Federal Reserve Bank of New York. Geithner is a Wall Street darling, but taxpayers may have a different take. Senator Jim Bunning (R-KY) reminded us at the Senate confirmation Hearing January 20 that Geithner was part of every bailout and every failed policy put forth by the current Treasury secretary. After you read this, you should begin to see why I’m so opposed to Geithner’s appointment – I don’t want the fox any closer to the hen house than he already is. For starters, look at what the Fed has admittedly been up to – this is from a recent speech by the President of the San Francisco Fed, Janet Yelin. The Federal Reserve Act authorizes the Fed to lend to “individuals, partnerships, or corporations” in extraordinary times. For the first time since the Great Depression, the Fed is invoking this authority to make direct loans to subprime borrowers – that is, those who can’t get credit from a bank. Notice how easy it is to double our money – they just keep the printing presses running. In fact, the recent expansion is extraordinary. Since 2003 the Fed’s balance sheet averaged only $838 billion. So this doubling has all taken place in the past year. In the last recession, around 2002, the Fed’s balance sheet increased by only 13%. If the current recession started in 2007, and if the Fed’s balance sheet is any gauge, then we’re in for much worse. Where are they spending all this cash? You probably didn’t hear that the Fed started buying commercial paper through these “private-sector vehicle[s]” created to sidestep an act of Congress. (Commercial paper is the short term debt of corporations.) Another thing you aren’t hearing about is that back in November 2008, the Fed bought $600 billion of mortgage-backed securities from AIG. This action, if taken without subterfuge, would not be legal. The Federal Reserve Act limits the Fed to buying securities that were issued or guaranteed by the U.S. Treasury or U.S. agencies. In order for the Executive Branch to get around a limit placed by the Legislative Branch, the Fed got help from the Treasury. Yelin laid it out unabashedly: “Cooperation with the Treasury is necessary because the program entails some risk of loss and, under the Federal Reserve Act, all Fed lending must be appropriately secured. The Treasury has committed $20 billion of TARP funds to protect the Fed against losses on the Fed's lending commitment of up to $200 billion.” Don’t kid yourself: this is a credit default swap on a national level. In an odd twist of democracy, you can read all about Geithner’s personal income tax problem but you won’t find anywhere information on who is benefiting from this particular bailout money which Geithner is in charge of passing out. The commercial paper bailout from the Fed (this doesn’t include anything that Treasury is doing or that Congress has authorized) stands at $333 billion. They aren’t done, either. According to Yelin, there are plans in place to substantially expand this spree of lending, buying, and guaranteeing to include more kinds of assets issued by more kinds of institutions, like commercial loans and non-agency mortgage-backed securities. He couldn’t, in six years, stop the primary dealers in US Treasuries from selling more bonds than Treasury issued. The only way this could go on to the extent that it did, with an average of $2.1 trillion of Treasuries sold but undelivered for seven weeks from September 24 to November 5, is because Geithner did not have the support of the “financial troops” to stop it. In fact, I will suggest to you that this level of abuse, in what amounts to massive naked short selling of US Treasury securities, could only be done with complicity. Finally, it is a simple matter to compare Geithner’s activities at the Fed to those of Ken Lay at Enron. Remember all those “partnerships” with cool names derived from Star Wars movies? Geithner’s New York Fed created Delaware Limited Liability Companies with the name “Maiden Lane” which is the Fed’s street address in New York. They are using unregulated companies to make loans and to buy and sell assets completely outside the view of the public. The Senate Finance Committee approved Geithner’s nomination on January 22, 2009 in an Open Executive Session. Geithner has proven he can hide the ball; let’s not let this scheme move to Treasury. Submitted by AdrianQ on Tue, 04/28/2009 - 01:33. The one that will seat for the position must be credible, one who have a good track of record, so a to avoid any dispute.Anyway if you are in financial trouble, u may get a get direct deposit payday loans. Direct deposit payday loans sound like what they are, a payday loan deposited directly into your checking account. A similar popular option is faxless payday loans, just present usually just a pay stub, ID, and an active checking account. There are numerous payday loan cognates that describe the same things, so it's good to do some research on where you want to get one from. You can use direct deposit payday loans for temporary debt relief. Submitted by kenstremsky on Tue, 02/17/2009 - 17:22. "No State shall enter into any Treaty, Alliance, or Confederation; grant Letters of Marque and Reprisal; coin Money, emit Bills of Credit; make any Thing but gold and silver Coin a Tender in Payment of Debts; pass any Bill of Attainder, ex post facto Law, or Law impairing the Obligation of Contracts, or grant any Title of Nobility." Inflation has been a major problem for our country since the Federal Reserve was created and the passage of Amendment Seventeen. Congress should eliminate the Federal Reserve or veto many of its decisions. If the majority of the United States Senate wants a Federal Reserve decision to be vetoed, it should be vetoed. If a majority of the United States House of Representatives wants a Federal Reserve decision to be vetoed, it should be vetoed. People may want to support an Amendment to the United States Constitution that allows state governments to "coin Money" - make gold coins and silver coins so that the federal government may cause less harm to state governments. More gold and silver may be found. State governments may be better able to fund their operations. I would like an Amendment to the United States Constitution passed that allows each State to have at least 3 United States Senators and allows each State Legislature to choose at least 1 United States Senator. United States Senators chosen by State Legislatures may care more about the national debt, inflation, and other topics important to State Legislatures. I would like an Amendment to the United States Constitution passed that allows State Legislatures to repeal trade agreements, Treaties, federal laws, and federal regulations. I discuss taxation and manufacturing on my profile. I hope people will read my comments dealing with state budgets on newgeography.com. I discuss taxation and many other issues in great detail on my website. Submitted by NancyHfrGA on Thu, 01/22/2009 - 17:30. Dr. Trimbath is one of the more articulate and educated chief economists of our time. That being said, why is it, even in the midst of financial crimes still being committed before our very eyes, the "insider financial troops" continue to ignore the elephant in the closet? Dr. Trimbath, if you'll rattle that sabor a little higher and step up the frequency of pointed articles such as this one, it's probable you'd still be ushered over to the elephant's corner, and neatly packed in with at least 50,000 damaged, outsider, naked-shorted shareholders, oops, I mean victims of "fail to deliver" shares of stock. We won't mention any names - YET, but we do have certificates "held for this purpose" to prove it. Please enlist "helpers" to right these monumental wrongs. Together we are strong; I personally hold your opinion with the highest of regard and admire your tenacity in revealing the Truth. Submitted by Susanne Trimbath on Tue, 02/17/2009 - 12:58. Nancy, thank you for these very flattering comments. New Geography has given me a place to get my voice heard. That's something that was missing; even the non-conventional outlets that specialize in NSS/FTD have excluded my point of view. Mike Milken once told me that, in politics, it's aboutloyalty and not ability; hence people like Geithner are rewarded with appointment to Treasury, and get Congressional approval after tax abuses: he gave the financial aristocracy what they wanted when he was at Fed; and finance in turn passed it out in DC. I'm not sure what you mean by "enlist helpers". If you want to elaborate, don't hesitate to send me an off-board email. Submitted by Matt on Thu, 01/22/2009 - 16:40. The fact that Geithner was intimately involved in all this may actually be a good reason for him to be Treasury Secretary. He knows where all the bodies are buried--what was done, and why. At this point, do you really want an outsider coming in who has to figure it all out? There will be more oversight of him at Treasury than there was at the Fed. With the whole financial industry in the toilet, no one is pure and clean anymore. You broke it, now you better fix it! Submitted by Susanne Trimbath on Sun, 01/25/2009 - 11:19. Matt: I thought about that, too. Who better to fix the thing than the guy (or at least one of the guys) who broke it? But the problem here is that this problem was created by complacency. "We've always done it this way, so it must be right." "Wall Street is making lots of money; they must know what they are doing." And Geithner was at the center of it, with all the resources of the Fed, including full monitoring capability over the Primary Dealers and some disciplinary capacity, as well. Yet he wouldn't pull the trigger. He coddled and cajoled them and in the end he couldn't stop the $2 trillion theft in the Fall of 2008. Giving him a bigger gun isn't going to improve his aim. I agree with you that at least there could be more oversight of his activities at Treasury (at least it's a government agency and not a private corporation). Unfortuantely, I don't think Congress will agree with us: they have to issue subpoenas to find out what Paulson did with some of the TARP funds. Submitted by kenstremsky on Sun, 01/25/2009 - 13:30. Congress may regulate financial institutions as much as it wants. Congress may require that executives of financial institutions meet with members of Congress on a weekly basis dealing with how TARP funds are being used, their policies dealing with mortgages, their policies dealing with credit cards, and other financial matters. How much time do you think executives of financial companies want to spend in front of tv cameras talking to members of Congress? The more cooperative the executives are in providing info to Congress the less time they will probably have to spend in front of tv cameras. 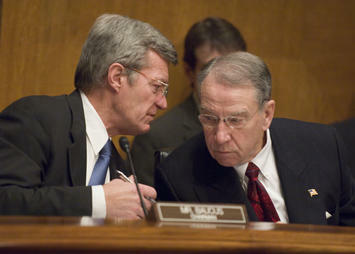 Congress may demand that banks and other financial institutions turnover info dealing with TARP funds. Congress may fine financial institutions that do not provide in great detail info dealing with TARP funds and other things. Congress may eliminate future employee bonuses of companies that have received TARP funds and set maximum employee wages for companies that have received TARP funds. Voters need to be more concerned about members of Congress who have received campaign contributions from financial companies. Voters should be pushing for a federal law that says that members of Congress may not work for a financial company as lobbyists and/or in any other positions for a financial company within 5 years after leaving office. Congress should eliminate the Federal Reserve or veto many of its decisions. Submitted by Hoss on Thu, 01/22/2009 - 11:42. The fact that the guy doesn't pay his taxes is all the reason I need to not see him seated. Somebody that makes that kind of "mistake" is not the person we need in charge of the Treasury.